Those dearest viewers who consider themselves a true fan of the cinematic experience already know the one activity they will happily partake in this week, no thrown bones about it! Forget the Urbana reference. Forget that Roger Ebert’s Film Festival provided nearly the same experience at the same venue almost 20 years ago. Forget that “Ebertfest” coalesced in the wake of a comparable screening at the same venue four years before that. Join the faithful with a clear mind and emerge from the darkened auditorium three hours later with an expanded perspective on our decidedly diminutive place in the universe, thanks to one of the great film productions. The Virginia Theatre, 203 W. Park Ave., Champaign, presents the 70mm roadshow, 50th anniversary re-release of 2001: A SPACE ODYSSEY using one of four prints overseen by director and film format advocate Christopher Nolan (INCEPTION, THE DARK KNIGHT) and cinematographer Hoyte Van Hoytema (DUNKIRK, SPECTRE, LET THE RIGHT ONE IN) that has been newly struck using photochemical processes and not digitized or enhanced at any stage. According to the Virginia, 2001 will only play in 70mm in downstate Illinois during their engagement. Show times are 7 p.m. on Monday, August 20, through Saturday, August 25, and 1 p.m. on Saturday and Sunday, August 26, with tickets costing a very reasonable $8. If you believe that watching a visual tour-de-force like 2001 on a television or computer screen is satisfactory, as you would the preview included here, then you should take advantage of this opportunity to witness just how immersive the 70mm gauge is when compared to your portable devices of choice or even the IMAX/3-D/reverb gimmicks at the nearest multiplex. Chuck Koplinski of the News-Gazette provides a solid rundown of the positives that will reward adventurous moviegoers if they visit the Virginia to see Stanley Kubrick’s masterwork. Between his write-up and the place of 2001 in the lexicons of Hollywood, science fiction, and popular culture, you pretty well know its reputation and we don’t need to delve into storyline, history, or controversies here. Simply treat yourself to the ultimate trip, folks. p.s. If you can’t attend the Virginia this week. Warner Bros. and the GKC Savoy 16 in Savoy already have you covered. 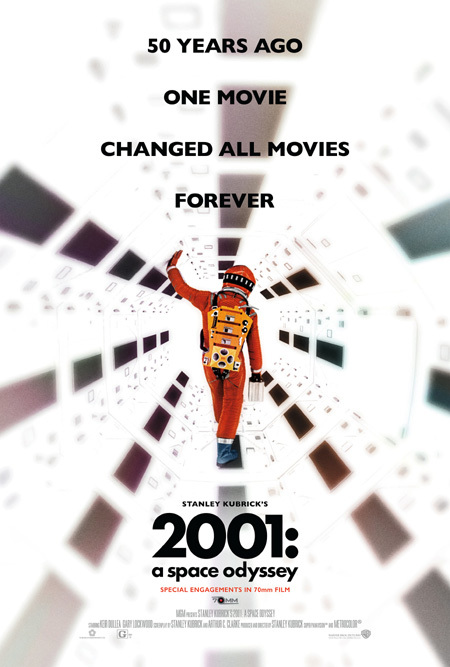 2001 will start a one-week-long IMAX run this Friday. p.s.2 Believe it or not, 16mm rental prints still exist for that other vintage epic far, far away from 2001 on the sci-fi spectrum – HARDWARE WARS, the famous spoof produced in San Francisco in 1977 by Urbana native Michael Wiese. This entry was posted on Wednesday, August 22nd, 2018 at 9:00 am	and is filed under Gone Hollywood, Media Coverage, Public Events, Roger Ebert, The Old School. You can follow any responses to this entry through the RSS 2.0 feed. Both comments and pings are currently closed.